If you want to add some easy Easter decor to your home, we have a fun decoupage craft that you can make today. 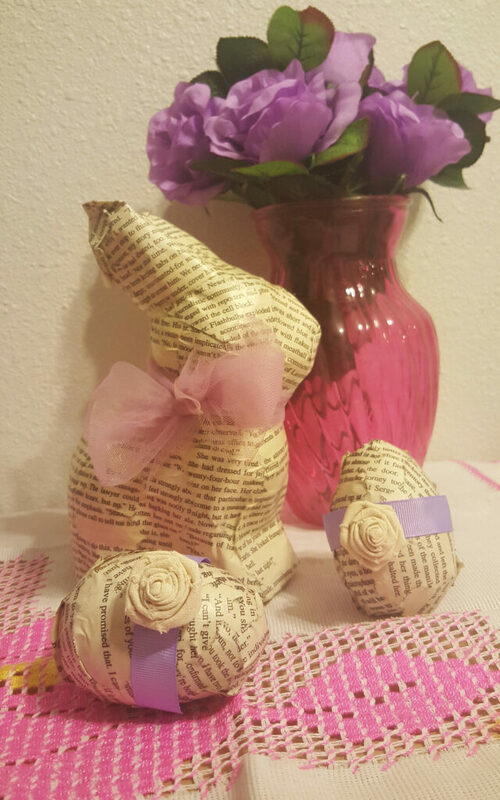 All you need are some old book pages and some Easter decor. It’s a fun project to do with kids. Have you tried decoupage using Mod Podge? It is one of my favorite craft supplies. It’s easy, messy and fun. You don’t have to be precise to have your project turn out great. You can find inexpensive Easter decor at your favorite thrift store. We found ours at Goodwill of Orange County. By using decoupage, you can tie together several items into an Easter centerpiece or display. Easter Bunny (plastic or ceramic) – If you don’t see any at the thrift store, you can find them at a craft store or dollar store. Optional: Hot glue gun and ribbons and flowers for embellishment. Step 1: Tear pages from your book into 1″ wide strips. The lengths can vary. You can estimate how many you need depending on the number of items you are going to cover. Step 2: Apply a generous amount of Mod Podge on a small section of your Easter Bunny figurine. Step 3: Use the sponge brush to apply the torn book page pieces onto the figurine. Smooth over any curves with your fingers. You can bend or tear the paper during this process and continue to overlap strips as you go to give it more depth and texture. You will do the same technique on the eggs or any other objects you chose. Spring chicks would be cute too! Step 4: Paint another layer of Mod Podge over the top. The wetter the paper gets with glue, the better it will adhere. Be sure to allow 15-20 minutes in between coats. Use your sponge brush with a little Mod Podge to glue the sides of pages down if they start to lift. Use your fingers to make the paper conform well to the figure. It’s messy, but this is what worked best. If you have any holes to cover, just tear up more of the page into small pieces to cover them. Note: The Mod Podge will apply white, but will dry clear. Step 5: Decorate with festive ribbons and flowers in your favorite springtime colors. It’s easy, messy and fun! 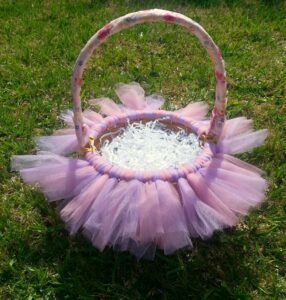 Wouldn’t the princess in your life be delighted to carry this DIY Tutu Easter Basket? It would also make a spectacular centerpiece for your Easter table. If you are a Goodwill thrifter and crafter, we think you will really enjoy our Pinterest board called Goodwill Finds Repurposed . We would love to follow you too!